Itemis-glen-1300 - Snowman in August, Calgary, Alberta. Itemis-glen-1301 - King Edward School, Calgary, Alberta. Itemis-glen-1302 - Valdy at Bow River Folk Arts Fair, Calgary, Alberta. Itemis-glen-1303 - Legalization of marijuana sit-in, Calgary, Alberta. Itemis-glen-1304 - Philanthropist Martha Cohen, Calgary, Alberta. Itemis-glen-1305 - Feature on Plus 15's, Calgary, Alberta. Itemis-glen-1306 - Disco rollerskating, Calgary, Alberta. Itemis-glen-1307 - Howie Meeker Hockey School, Calgary, Alberta. Itemis-glen-1308 - Scarboro Nursery goes to Mother's Pizza, Calgary, Alberta. Item is-glen-1304 - Philanthropist Martha Cohen, Calgary, Alberta. 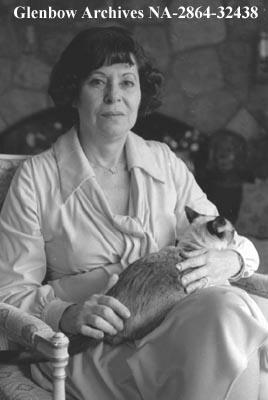 Philanthropist Martha Cohen, Calgary, Alberta.